Credit report repair, the next line of defense in improving your credit score. Your credit report is something that is generated by the use of credit. Credit cards, loans and utility payments of many types and how you pay these bills make up the information that comprises your credit report. Along with that report comes a credit score. Few would get by in this world without the use of a credit card (though many are now trying). So let's see how this was all put in place. The first credit reporting started perhaps a 100 years ago. Small businesses would get together and share information about customers. The idea mushroomed leading to the credit reports of today. As soon as you are old enough to have a job, bank account, any type of loan, cell phone or utility bills, information about you is being compiled. Banks and other financial institutions send information out monthly to credit bureaus. In credit report repair it is important to know how this information is used. Your Report is a record of your credit activity. It is used by businesses, financial companies,mortgage companies and a growing number of others including cell phone companies and on occasion possible employers and landlords. It's primary use is to assess what kind of risk you are to a company that is contemplating whether to extend credit to you. The information contained in your credit report is compiled at the three major credit bureau's, their affiliates and smaller internal ones at credit card companies. The information's bulk is about the accounts you have (what type they are),The account number,the acct. balance, the credit limit, when you pay, the minimum payment, any late payments, any accounts in collections,or judgments or liens. These reports (each bureau has their own) once compiled are ever changing as your "financial history" is ever changing. They are sold to businesses wanting to do business with you. Your Credit Score is determined by the information in your credit history. It is also ever changing. The most widely used score is the FICO (Fair Issac Corporation) scoring system. One look at the Fair Issac Corporation history will assure you of why theirs is the STAPLE when it comes to credit scores. So knowing what is in that report and how the score was determined is of great interest not only in Credit report repair but for anyone who wishes to ensure that accurate information is provided about themselves. The more positive information the better or higher your score will be and therefore less risk you will be. Though the credit report does not seem to dwell on the positive information. That is why credit report repair is so important. It is a constant work to keep the good information to the fore. This good information is what results in lower rates on insurance, mortgages, loans and credit cards.Understandably regular maintenance of your report is crucial!! One thing is certain, and a bit of history will support this, that this system was not put in place to benefit you the customer but was designed to benefit business and expand their profits. If you have much poor information on your credit report then you will be considered a risk and therefore the green flag for that lender to charge you higher interest rates and fees. Many times there will be inaccurate information on a credit report and the result is higher fees to pay....more profit for the companies. So constant regular review of your three reports is a must. When it is said the "three" credit reports we are referring to the three major credit reporting agencies or bureaus. They are Experian, Equifax and Transunion. The law allows one free report by each of these agencies per year at www.annualcreditreport.com. 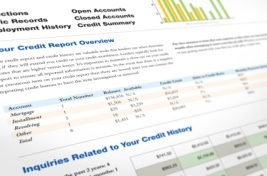 Your first step in credit report repair is to order all three of these reports. All three companies have sites that charge a fee for access to your report so make sure you stay on the links that bring you to your free one. You very well may want to use the paid ones in the future to continue your work on your credit score. So perhaps as you start your journey you may want to take note of the costs of each of these. Knowing what you are in for before accessing your reports is always helpful...the annual credit report....a guide before you go. Job number one is looking for inaccuracies. Make sure all account numbers are correct. If an account doesn't look familiar, a call to the reporting agency should clear that up. Examine personal data closely and ensure all numbers are correct. To work on credit report repair you must make certain that all this information about yourself is accurate. So once you find the inaccurate information or information that is omitted you will want to know about the how-to's of credit report disputes. The most common work in credit report repair will be common inaccuracies on your report and dealing with them which will result in quick credit repair. If you are one of those with little to no credit and are against the credit lifestyle many others live by, you show little evidence to produce a credit report but have a big purchase to consider then the addition of a non traditional credit report will be a help. If you are worried about not having a credit report or enough information to produce one then getting tips to establish new credit is an area to look in to. For additional credit repair info including credit repair information with articles, videos & company reviews (if this is all too much and you just want someone else to do the work).. Wherever you are in your credit report repair work, remember that it's the same as taking care of anything in life (car, house, boat) credit repair takes regular maintenance for optimal benefits!!! Sometimes that maintenance means clearing out the old. When you are thinking of cleaning up the credit report there are some considerations to think of first.